Myanmar is special for its rich cultural traditions and its never ending spiritual aspirations. Located in the fertile delta of southern Myanmar, Yangon has an abundance of lush parks, peaceful lakes and historic architecture. Lying on a plain along the Ayeyarwady River, this ancient city is dotted with thousands of ancient stupas and temples making it one of the most remarkable archaeological sites in Asia. Mandalay is the last Royal capital of the Myanmar kingdom. It is home to many different crafts as well as the world’s largest book. You will also see the unique style of fishermen at Inle, who stand at the stern on one leg and wrap the other around the oar. Spirit of Myanmar is a journey into the soul. Arrive in Yangon where you will be met and driven to your hotel. Drive by old and restored British mansions and a central lake. Then explore the five-story National Museum to get a glimpse of the country history, culture and belief through priceless collection of historical artifacts such as memoirs from its history and countless artworks denoting the talent of the Myanmar’s people. Later in the evening, visit the magnificent, 2,500-year-old Shwedagon Pagoda. Heavily gilded and decorated with diamonds, it is a spectacular sample of temple architecture and the country’s holiest Buddhist shrine. After breakfast, you will be driven to the Yangon airport for your flight to Bagan. Visit the rustic Nyaung Oo market, the stunning Shwezigon Pagoda built the early 11th century and Wetkyi-In Gubyaukgyi, a cave temple with exquisite murals. In the afternoon, continue your exploration with stops at the splendid Ananda, an architectural masterpiece with two standing Buddha images whose facial expressions change depending on the distance they are viewed from, the Ananda Okkyaung, one of the few surviving brick monasteries from the early Bagan period, and Thatbyinnyu, the highest stupa in Bagan. Enjoy the sunset from the upper terrace of Myauk Guni Temple. In the morning drive to Mt. Popa, an extinct volcano and legendary home of the Nats (spirits). You visit the tomb of the late Popa Sayadaw, an important monk in Mt. Popa’s history and find out about the people’s belief in spirits (Nats) and how it blends in with traditional Buddhism. The afternoon is free at your leisure or you can proceed to Myinkaba village and observe how traditional lacquer ware, one of Myanmar’s most treasured handicrafts, is made. After breakfast, transfer to Nyaung Oo Airport for your flight to Mandalay. This town is home to many different crafts as well as the world’s largest book. Upon arrival, enjoy a quick visit to Myanansankyaw Golden Palace, a replica of the old palace. Majestic palace walls, city gates superimposed by pavilions and the surrounding moat are standing evidences of its former grandeur. Continue your sightseeing with visits to Mahamuni Pagoda, famous for its venerable statue of Buddha heavily covered in gold leaves, Kuthodaw Pagoda with 729 marble stone slabs of Buddhist scriptures (known as the world’s biggest book) and Shwenandaw Monastery, noted for its exquisite woodcarving. Drive to the 18th century capital, Amarapura, to visit U Bein’s Bridge, the longest teakwood bridge in the world. It was built with teakwood pillars salvaged from the deserted Inwa Palace. 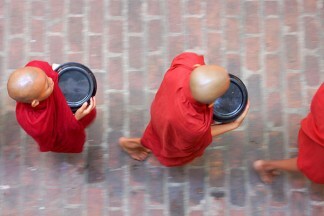 Stop by at Mahagandayone Monastery, where more than a thousand monks and novices live and study the doctrine of Buddha. Explore traditional handicraft workshops such as woodcarving, marble masonry, Kalaga tapestry and gold leaf making. Visit the bustling market. Locals in colorful costumes trade farm products such as vegetables, fruits, dried tea leaves as well as animals in a vibrant atmosphere. Spend the rest of your day at leisure.